I noticed this essay amidst the similar looking Updike manuscripts that lay before me. I had just moved to Cambridge after having lived in New York City for thirteen years. Despite a better job and a bigger apartment, I missed my neighborhood and the all-night bodega. I missed the sidewalks abuzz with activity. I even missed the stinky old F train. 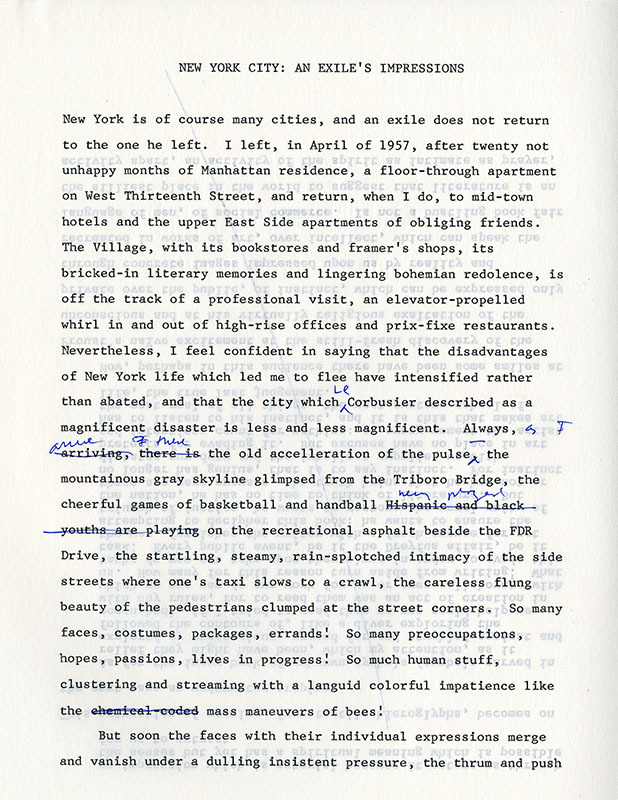 Finding this typescript with Updike’s manuscript corrections where he so beautifully expresses the complexity one can feel for a city such as New York connected me to what felt like a movement of people travelling between cities, missing aspects of one and embracing parts of another. Seeing the fluidity with which we humans travel between locations and identities, and how we adapt and reflect, helped ease what was a painful transition.